The ancient city of Kaisers and bishops, Bamberg was designated a UNESCO world heritage site in 1993 and lives with and from its rich history while striving to stay on the cutting edge. With 70,000 inhabitants, the city prides itself in being an important economic hub and a young college town with a high quality of living. Consistent administrative action focused on public accessibility, transparency, and economic efficiency contribute to the satisfaction of the city’s residents. The city introduced citizen’s accounts as just one of several different measures to improve satisfaction. The goal was to significantly reduce the volume of addresses by assigning one address per person. The fact that each natural or legal person can have various addresses (business headquarters, second home, etc.) or contact person not only caused the number of addresses to grow exponentially, but also created a large amount of maintenance work and reduced clarity and transparency. At the same time, the project managers also wanted to increase the quality of addresses, for instance by comparing the data with the online registration office MESO in order to reduce the amount of undeliverable and returned mail and the associated costs and personnel expenses. The Franconian city received support from Axians Infoma to handle this project. The company was working on a new module for central address management for its single-entry Infoma newsystem financial accounting, a solution the city of Bamberg had used since 2010. The requirements of the independent city, located on the Regnitz river, made this a good opportunity to gather some experience and suggestions from practical application that could then be used to develop additional functions. The city agreed to become a pilot user for the module. After Axians Infoma quickly completed the full set-up process, Bamberg began using the system to optimize its address files in August of 2012, reporting that it had finished the project in just a short time: They reduced their 79,220 addresses to just 65,640 individuals. The addresses were also standardized and summarized under specific persons. That means launches were used to automatically standardize the address data, for instance by using the same spelling for the word “street” in the system or ensuring the house number field is filled out correctly and not included with the street name. The goal is uniform formatting for all data. To reduce manual changes as much as possible, individual reports were created for missing address codes and for first and last names entered in the wrong order. This fulfilled one key requirement of project managers. Compared to the previous process, they are now able to maintain several different addresses for each natural or legal person. All information needed for processing is summarized under one “person,” and the central address is able to generate additional synergies. That means identical addresses are adapted automatically any time one of them is changed. If a person does have several different addresses, the processor immediately has a uniform overview of all their financial data, such as control objects. Although they are primarily used in the taxes and fees area and the Cash department, the address entries come from all over town administration. Now, they are managed centrally directly through Infoma newsystem. The central address management module is fully integrated into financial accounting, however it also allows all other processes – for processing offense administration, for instance, or wages and salaries, or managing social services – to use the functions. 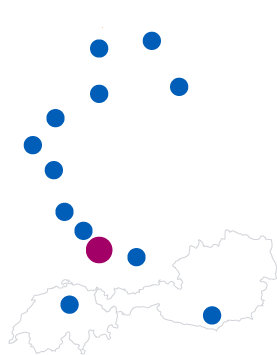 Although the Bamberg project managers were entirely satisfied with the options offered by central address management, as well as the improvements it brought to their processes and the project support they received from Axians Infoma, they did need to make some adjustments in practical application. The pilot users requested, for instance, that multi-address account statements be created for citizens summarizing all of a person’s existing addresses in one complete overview. Their other request was to simplify processing in case addresses needed to be changed, especially in the tax area. In the past, the processor essentially needed to be “psychic” to recognize when an address (address without data matching) or person (address with data matching) needed to be changed. With the option to always change address data through the address, Axians Infoma implemented this practical request. Now, individuals and all their other addresses can be matched up through data matching. The processor doesn’t have to differentiate between this data, and it is updated automatically in all relevant maps / tables. Even though Bamberg does still intend to optimize its interfaces and further improve address quality after six months of live operation, planning is moving forward. In the future, they plan to centrally deliver payment reminders to the “person” in order to save costs. 2010 single-entry conversion to Infoma newsystem with budget, cash, and accounting system, budget planning, budget implementation, Cash department, enforcement taxes and fees, central address management. In the Bamberg city disposal and construction department: Municipal departments, financial accounting, cost and results accounting, fixed-asset accounting, loan management, and invoice workflow.